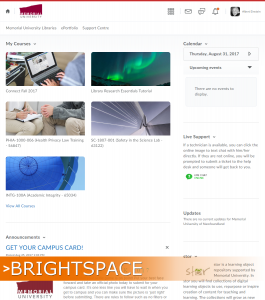 Brightspace (D2L) is Memorial University’s Learning Management System (LMS), used in the delivery of both on campus and on-line courses. The following guides are designed to provide students with assistance becoming familiar with Brightspace (D2L) and integrated learning tools. Among other things, students will learn to navigate through their course, use important tools and customize their Brightspace (D2L) account. Students are encouraged to contact CITL Support Centre if they are unable to resolve any issues.